Presented for Introduction to Lifestyle Medicine, Harvard Extension School: PSYC E-1037. These notes are intended as additional resources for my brief presentation on October 21, 2014, for Introduction to Lifestyle Medicine, which is a Psychology Extension course at Harvard University. This is based on my personal notes while preparing for the research and the published research findings. I blog about them as a series. Read Part 1, Part 2, Part 3, Part 4, Part 5, Part 6. In healthy individuals, the hypothalamic-pituitary-adrenal (HPA) axis functions to adapt the body to acute stressors through a cascade of hormonal responses, including the secretion of Corticotropin-releasing hormone (CRH) in the hypothalamus, release of Adrenocorticotropic hormone (ACTH) in the anterior pituitary gland, and secretion of cortisol (glucocorticoids) in the adrenal cortex. 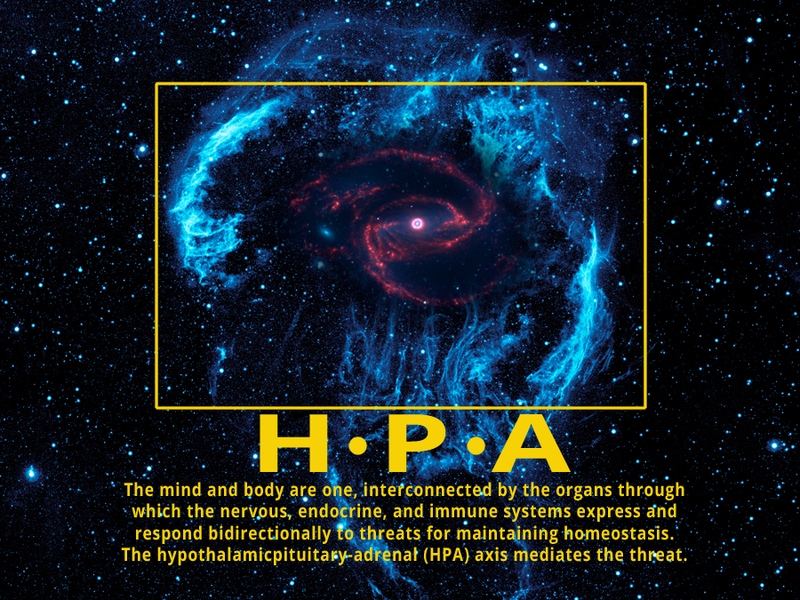 Chronic elevation of cortisol, coupled with genetic factors, personal traumatic history, and unhealthy lifestyle, however, has harmful effects on the body, leading to dysregulation of the HPA axis. Dysfunction of the HPA axis, characterized by abnormally high levels of CRH and low levels of cortisol, is one of the distinct neuroendocrine profiles that differentiates PTSD from other mental disorders. Cortisol plays a key role in the pathophysiology of PTSD. In healthy individuals, an increase in basal cortisol levels is associated with improvement in declarative memory and performance accompanied by normalized glucose metabolism in the limbic system, the parts of brain primarily responsible for emotional aspects of life, aka the center of emotions, that include the hypothalamus, the hippocampus, the amygdala, and several other nearby areas. Individuals with PTSD symptoms have decreased basal cortisol levels, although not all studies agree with this finding, and a greater sensitivity of cortisol negative feedback inhibition in the HPA axis compared to those without PTSD. In persons with chronic PTSD, basal cortisol level increases are associated with symptom improvement. Exercise is associated with transient increases in plasma cortisol and improved cognitive function among healthy individuals. Low- to moderate-intensity mind-body interventions have also shown positive effects on PTSD symptoms. The question is whether there is an accompanying change in basal cortisol levels associated with the improvement in PTSD symptoms. Individuals with PTSD have abnormally high secretion of CRH but a low level of ACTH, the hormone responsible for inducing secretion of glucocorticoids in the adrenal cortex. 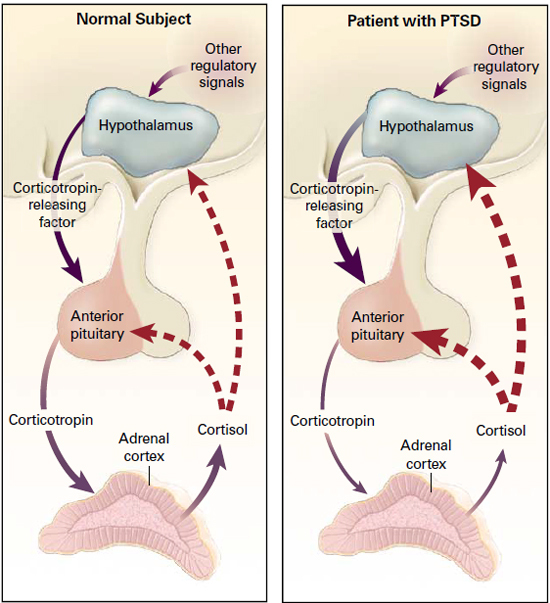 Blunted ACTH response to CRH may lead to hypo-secretion of ACTH in the pituitary gland, resulting in a decrease of cortisol production in the adrenal cortex. Studies indicate that dehydroepiandrosterone sulfate (DHEAS), an anabolic steroid molecule, may enhance resilience to stress via neuroprotection against cell death and behavioral deficits, and that exercise significantly elevates DHEAS levels. To explore the underlying neuroendocrinological mechanism(s) of the improvement in symptom severity associated with mindfulness-based stretching and deep breathing exercise, we measured plasma ACTH and serum DHEAS to examine whether a relationship between an exercise-induced decrease in PTSD symptom severity and an increase in the levels of serum DHEAS and plasma ACTH exists as a result of MBX intervention. To be continued in Part 8: Conclusion. This entry was posted in Mindful Movement and tagged endocrine, exercise, hormone, MBX-12, mind-body connection, neuro, PTSD, research, Sang H. Kim, stress hormones, stress management. Bookmark the permalink. Ok, so I want to read Part 8, where is it? What was your study outcome? I am blessed to have found your work – thank you!